PRIVATE LUXURY RETREAT NEAR CATARACT GORGE..... WE ACCEPT ONE, TWO, OR MORE NIGHT STAYS AS AVAILABLE. WHAT WE OFFER OUR GUESTS : QUALITY, PRIVACY, VIEWS, COMFORTS AND MORE..
Nestled in a secluded topiary garden, ensuring privacy, views and a light airy environment for our guests . Situated in a secluded topiary / succulent artwork garden - MINUTES FROM LAUNCESTON CBD and 5 minutes walk to The Launceston Cataract Gorge, First Basin & Cliff Grounds - Launceston's premier tourist attraction . A tranquil interesting garden setting, rooms capture the sun and views of the garden, Launceston City and mountains . The locally designed & made furniture highlighting Tasmanian black heart sassafras timbers gives this apartment a Tasmanian unique style. Local artist works decorate Topiary Haven's interior.The spacious kitchen with cathedral ceiling and chandelier is fully equipped allowing you to cook up a storm if so desired. Eat at the breakfast bar or in the separate dining area with views of the garden or mountains - or the outside patio bbq area . Dishwasher, ice making fridge, microwave, free standing cooker - guests just need to open up the cupboards for gadgets & utensils required for cooking. Interesting Tasmanian pottery and retro items in the display cupboards - owner's collection. Use the available produce (when available) from the potager garden for a fresh salad (we supply garden salad veggies bowl, herbs to all our guests). You may opt to cook inside or outside on the barbecue & enjoy dining on the private patio or in the separate dining area. A romantic candlelight dinner for two may be what you desire and Topiary Haven is that perfect private place. Perfect romantic accommodation for all. Sourcing some of our best food is easily done in Launceston due to the size of the city and travelling time . Tasmania is renowned for fresh produce, food & wines and the Tamar Valley is a showcase for beautiful wine and food. Supermarket, shops, delicatessen /providores and hospitals are just 3-5 minutes away. Close by are some of our top cafes & restaurants ( we have a list of our favourites ) that you can visit to taste the fresh Tasmanian fare. Comfortable leather lounges ( Launceston manufactured ) allows you to stretch out and relax to watch a movie, television ( LCD)in lounge room or listen to some music( CD,DVD, ipod or iphone docking unit) from a selection of CD & DVDS. A perfect place to return to after a day touring or working in or around our city. The large bedroom has an area with a contemporary chaise longue and good lighting for reading, writing or relaxing. The queen bed has a quality mattress and linen, LCD television on the wall, clock radio with ipod / iphone docking . Just the environment for relaxation and a good nights sleep. You will not be awakened by traffic or public noise in this apartment . PLEASE NOTE : Extra guest a quality fold/ rollaway bed and a portacot is available on request, rates as advertised. The separate walk in wardrobe is conveniently located off the bedroom with plenty of storage and includes complimentary bath robes for guests use. The separate en suite has a walk in shower and complimentary toiletries. Separate fully equipped laundry. ESSENTIAL TO GUESTS - ONSITE CAR PARKING , Metro bus stop across the street . Excellent outdoor lighting all the way to your door . We have many hundreds of pot plants around the garden /patios for guests to view and get ideas for their gardens or indoors , including lots of topiary plants . Excellent outdoor lighting all the way to your door . Launceston's many attractions includes our charming city situated at the head of the Tamar River in the Tamar Valley . The mixture of Georgian, Victorian, Federation, Art Deco,and contemporary architecture gives Australian's third oldest city lots of charm.The surrounding hills are dotted with residents homes , surrounded by distant mountain ranges and native forests and over looks the the beautiful Tamar Valley. A must visit is the Cataract Gorge and Cliff Grounds ( 5 minute walk from Topiary Haven, Tamar Valley ,Queen Victoria Museum & Art gallery , Railway Museum , Boags Brewery, Classic Car Museum, Tamar Valley Vineyards, Lavender Farm, Holly Bank Adventures,Tasmania Zoo, Beaconsfield Gold Mine and the 'many more attractions ' in the surrounding areas. What ever direction you choose to travel in Tasmania you will be captivated by the friendly hospitality of the people and the islands picturesque & rugged landscapes . Travelled and lived overseas before returning to Launceston to bring up the ' kids.' Love Tasmania for its compactness, beautiful wild wilderness, sea / beach landscapes, our settlers convict / colonial past, fresh foods and cool climate wines... Topiary Haven is situated 5 minutes drive from the Launceston CBD, The Launceston Cataract Gorge and Cliff Grounds and the lovely Tamar Valley wine region. 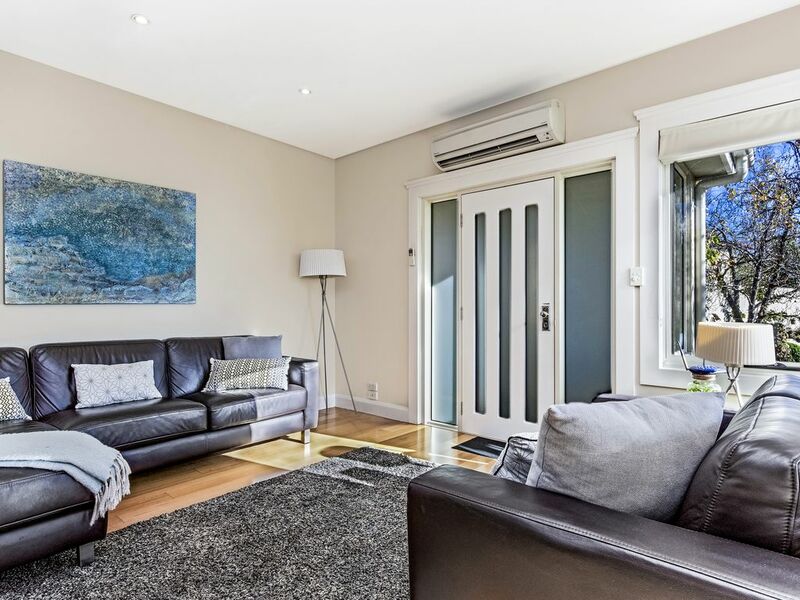 Situated in an elevated position with views of the garden, leafy neighbourhood, city and mountains is part of the charm of inner West Launceston Originally built for music rooms for two sisters to teach students music.. I wondered why the original lights in the property were all on the walls. Our octogenarian neighbour informed me of the history of Topiary Haven. The lights were on the walls for the piano, violin for their students to read the music. No doubt the sisters organized their violin and piano students to not be in the 'music rooms' at the same time. The next owner of the properties was a 'canny bank manager,' who saw the $$$ and converted the music rooms into a self contained 'flat' for rent. We bought the properties when the rear property was a self contained cottage 27A and the main residence number 27 was a owner's residence. Over many years we have developed a garden which attracts the birds into our garden. Gutted 27A ( Topiary Haven Garden Gallery) when the kids eventually ' left home' & rebuilt for you in 2012!! Topiary Haven is situated 5 minutes drive from the Launceston CBD, The Launceston Cataract Gorge and Cliff Grounds and the lovely Tamar Valley wine region. Situated in an elevated position with views of the garden, leafy neighbourhood, city and mountains is part of the charm of inner West Launceston..
Love the closeness to the city, Cataract Gorge and the elevated position gives us views - gardens city and distant mountains over the seasons. Close to The CBD , The Launceston Cataract Grounds & Cliff Grounds and the Tamar Valley Tourist Trail..
Vanity unit, large mirror, walk-In shower, toilet, towel stand and towel hooks on wall. All quality linen for beds supplied. Linen pillow cases. Down pillows as well non down pillows. Mattress & pillow protectors. Washing machine in property laundry. Washing powders provided. Electric dryer in property laundry. Wifi NBN rated 10/10 by guests. Google Chromcast enables you to stream from your smart devices. Bath, beach and tea towels supplied for guests stay. Our guests rate our Wifi 10/10 - we employed a local computer business to install a 'super aerial' to allow our guests to enjoy an excellent NBN Wifi service. Spacious living room accommodates our guests comfortably. Comfortable top quality leather lounges - made locally for us. Fisher and Pakel Drawer Dishwasher. Large fan forced electric oven. Delonghi Expresso Coffee Machine, plus a coffee plunger for ground coffee. Selection of cooking essentials provided. Full breakfast provisions, biscuits and more..
Large fully equipped gourmet kitchen. Flat screen lounge & bedroom televisions. Connected to DVD player. Google Chromecast dongle. Compact unit ipod docking, DVD, radio. Two steps pathway access & one step into property. Excellent outdoor lighting. Proved to be a great location for touring town, Cataract Gorge and both sides of the Tamar Valley. Appreciated very well equipped kitchen, comfortable lounge and spacious bedroom. Thank you Diana and Barry for such an amazing place to stay. The whole experience was amazing, the apartment, garden and hospitality was special. We will definitely be back! Thank you for the wonderful review of our accommodation.. Loved meeting you both and your ' beautiful little boy '! . Thank you once again, Kindest regards, Diana & Barry. We could not fault the Topiary Haven Apartment for superior comfort, space, inclusions, ambiance, decor, location and gracious hosts. We thoroughly enjoyed our stay and would recommend this apartment to anyone wanting to stay in Launceston. The lovely breakfast hamper was also an excellent inclusion. We did not want to leave. Loved our stay. Beautifully finished and furnished cottage. Lovely extras in the fridge and pantry. Owners extremely helpful & considerate. Only regret is not being able to stay longer. Highly recommend Topiary Haven. Minutes from the Launceston Cataract Gorge & Cliff Grounds, CBD, museums, pubs, cafes/restaurants and close by The Tamar Valley Tourist & Wine Trail..